Originally published under the title, "Turkey: Where Ice Cream Can Be More Dangerous than Bombs." Sometimes one small incident best tells how countries can go insane. The pro-government Islamist psyche in Turkey has no limits in defying logic and humanity. Prime Minister Ahmet Davutoglu's native province, Konya, in central Anatolia, has traditionally been an Islamist stronghold -- before and after Turkey's ruling Islamist party, the Justice and Development Party (AKP), was founded in 2001. In parliamentary elections on June 7, AKP won 65% of the vote in Konya, compared to 40.7% it won on a national scale. On October 13, three days after a twin suicide bomb attack in Turkey's capital, Ankara, killed more than 100 Kurds and pro-Kurdish, leftist and secular Turks, Konya hosted a Euro 2016 football qualifier between Turkey and Iceland. Before the kick-off, both teams stood in silence for one minute to protest the bomb attack -- a typical gesture to respect the victims. Sadly, the moment of silence was marred by whistles and jeers: apparently the football fans of Konya were protesting the victims, not their jihadist killers. Turkey has detained more people for tweeting against the government than for being members of ISIS. This response was perfectly in line with what the government has been doing since the attack took place. The police found that the perpetrators belonged to a Turkish jihadist group linked to the Islamic State (IS, ISIS or ISIL). But Davutoglu insists that the bombing was an act of "cocktail terror" bringing together two hostile groups: jihadists and Kurdish militants who fight against each other in Syria. The prime minister cannot admit that jihadists could bring carnage to the heart of Ankara. His government quickly instituted a gag order on the bombing, and told journalists to shut up. "Is it so hard to say it was an ISIL attack," prominent columnist Murat Yetkin asked in his column. It is. Because: a) It would be just too embarrassing for an Islamist government to be hit by jihadists whom it had so generously supported in the past, and b) it would be risky to say publicly that Islamist Turks killed their own people just weeks before a critical election and in a country where Islamist sentiments are strong -- as observed at the kick-off ceremony in Konya. And while Turkey was not targeting ISIL, and focusing on other things, names related to ISIL conducted the biggest bombing attack in the history of the Turkish republic ... I talked to two different sources at the Pentagon. The first official said, 'In the beginning they [the Turks] joined the operation, but then for a long time they did not [participate in it].' In other words, during the month of September, while Turkey earmarked its resources to the fight with the [the Kurdish] PKK, it did not even try to hit ISIL. But the first initial trials became unsuccessful. The second official pointed to the political dimension of the issue and said, 'The priority for Turks is the PKK ...' In other words, Turkey on the one hand used in the wrong way its resources by not focusing on ISIL and on the other, was unsuccessful in hitting ISIL targets. It was not surprising that Turkey has joined half-hearted only three US-led airstrikes against IS. At the hands of power-greedy Islamists, Turkey continues to be a bad joke, the ridiculous cradle of black humor. Sezgin Tanrikulu, a leading opposition member of parliament (and a Kurd himself) said that Turkey has detained more people for tweeting against the government than for being members of the Islamic State. He forcefully reminded everyone that Turkey did not categorize IS as a terrorist organization until a court order to that effect on July 15. "Without [government] protection this massacre [in Ankara] would not have happened," he said. In the same way the news of whistles and jeers for the terror victims sounded surreal, the news on a police operation targeting "dangerous terrorists" looked amusing if not utterly ridiculous. The police, who failed to prevent the bombing attack in Ankara, detained 25 businessmen in the western province of Usak on suspicion of terrorism. During their interrogation, the police asked them questions including: "Why did you go to prayers together?," "Why did you all go to eat ice cream after prayers?" and "Why did you go abroad 20 years ago?" 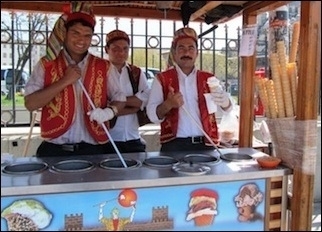 Welcome to Turkey, where ice cream can be more dangerous than bombs.